McCONNELSVILLE, Ohio — AEP employees and retirees are invited to take a relaxing trip back in time when horses were the prime mode of transportation. The 16th annual AEP Employee and Retiree Trail Ride at AEP’s ReCreation Land Equine Activity Area will take place August 10 and 11 at the site, located about seven miles north of McConnelsville, at 3400 E. State Route 78. The Employee and Retiree Trail Ride will be held at AEP ReCreation Land’s Equine Activity Area in Morgan County near McConnelsville, Ohio. The location marked “F” above is the Miner’s Memorial Park; “C” and “G” are camping areas. Participants must bring their own horse. The ride kicks off at 10 a.m. Riders should pack a trail lunch. A potluck dinner is scheduled Saturday night with meat for grilling provided by AEP. Anne Lindimore, administrative associate at Muskingum River Plant, coordinates the outing. Free camping, firewood and horse water is provided. No electricity is available at the campsite, but there are portable toilets and the area has tie lines and picnic tables. The trailhead staging area can accommodate 100 horse trailers. A permit is required to use the Equine Activity Area, which is open to the public and is available free online at AEP.com. View a map of AEP’s ReCreation Land. 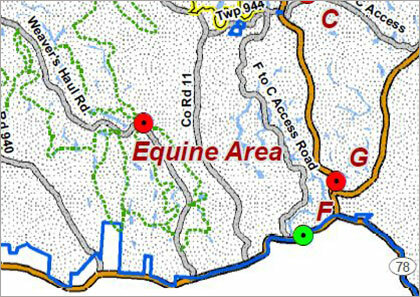 View a detailed map of the Equine Activity Area. For more information, contact Lindimore at (740) 984-3487, or by email at aylindimore@aep.com.